I am fortunate to say that growing up, I was not only introduced to the sport of archery and hunting, but I was fully supported by the man that brought me that joy, my Dad. My parents gave me my first compound bow for Christmas when I was 11 years old. Through that gift, we opened a wonderful father-son relationship that included: indoor archery leagues, indoor/outdoor archery tournaments, college archery team, 3-D shoots, and bowhunting. Bowhunting was a release, almost a way of life, while I was in high school. Dad and I would compete with each other (in a good sense) whenever we shot. Stump shooting was a daily occurrence around our hunting camps, at a time when the earlier built compound bows would not shoot light-weight arrows at the speed of light (as today’s high-tech bows appear to do). As we turned towards faster bows, we found that the arrows they propelled would not withstand the punishment of hitting a boulder that you thought was a soft, dead log. The traditional archery bug bit me when I was about 16 years old. I started with an old 45 pound Bear Kodiak Hunter recurve that a neighbor had given me, and that prompted Dad to pull his first bow out from underneath the bed, a Black Widow take-down recurve that he bought about the time that I was born. I stuck with shooting the recurve bow instinctively, while Dad tried to shoot both his compound (with sights) and his recurve (instinctively). He found that didn’t lead to accurate instinctive shooting, so he would primarily carry his compound while hunting, and then practice stump shooting around camp with his recurve. Still, we would enjoy each other’s fellowship as we would walk in the woods, pick a difficult stump shot, and watch the arrow gracefully and quietly sail towards the spot. It was something that only we shared. It was special. As kids often do, I grew up and left home. 4 years in the Navy didn’t lead to much stump shooting, or hunting for me, but in 1995 Dad and I were able to build 55 pound take-down recurve bows from kits that we got from Windwalker bows. We then ribbed each other as to how his/my bow was better than each other’s . . . I said his bow looked orange, and he said mine looked like a 2x4 (AT LEAST IT’S NOT ORANGE!). I went to college at NAU, but once again, we didn’t have the same opportunities of shooting or hunting together. Flagstaff had plenty of stumps to shoot at, but my parents toured the country after Dad retired. I longed for the times to hunt together, but either didn’t have the time or could not get drawn. Until this year. I was elated to find that Ray Cemansky, Dad and I were drawn for archery cow elk in 5B South. This was old stomping ground for Dad and Ray. To see those two together while hunting makes you appreciate how they honed the system they use. They know even simple things like which crate to look in to find the other’s bottle of dish detergent, extra batteries, or how many meals each other will bring. They even know what meals cause odoriferous emanations in each other (ha!). It’s kind of like being married to yourself. My wife gave me a kitchen pass to go hunting for a week (I know, it’s a two-week hunt, but she doesn’t give out the passes often). The elk hunt was here, and I was ready! The first few days of the hunt were warm. The elk seemed to be in the area where we were hunting one day and then be gone to a different area the next day. This may have been due to the unseasonably warm weather or hunting pressure. Whatever the reason for them moving, we did the same and tried finding them as they moved about. Regardless of whether I would see some elk or not, I knew that when I got back to camp, Dad would be up for some stump shooting. I carried my light-weight recurve with me as I hunted. Dad and Ray carried their heavy IRON compounds, but Dad brought his recurve to stump shoot with -- something we had not done together for about 8 years. As the days of the hunt went by, our stump shooting shots became more challenging. A few of my 31" aluminum shafts were turned into 28" shafts for Dad, as the competition grew more intense. I had seen several herds of elk during the first 5 days of the hunt. I had one shot on the 2nd morning, but shot low and missed. That started me thinking more seriously about the carbon arrows that Dad had assembled a few days before the season started. We hadn’t wanted to hunt with carbon shafts before because they could splinter and stick carbon fibers in the meat of the animal, but these carbon shafts are made with five-layers of woven material, and magazine writers gave them a thumbs-up for use in hunting. So I began leaning towards using the woven-carbon shafts to help flatten out the cast on my shots. A transition in the middle of the hunt from aluminum shafts to carbon shafts could have been an error in judgement had it not been for the many hours of practice we had each afternoon. I was very pleased with the increase in speed that I obtained from the carbon shafts. I practiced both with and without broadheads, and my groups remained tight. I felt I may have missed my only opportunity for a shot with traditional equipment, but September 19, 2001 would prove that wrong. The morning felt especially cold, 37 degrees when we left the truck before dawn. I entered a hunting area that I had hunted 2 days earlier. I saw the same elk sign on the ground, but there was something new to the area -- CATTLE. Not just any cattle, but noisy, vocal cattle. My hunt would be over the next day, and I had to pick an area with cattle -- Great! I used that morning to thank the Lord for the riches in spirit that he has brought to me and my family, and how he has provided me with the memories of this perfect reunion hunt for Dad and me. I started to head back to the truck at 7:30 am when some movement caught my eye. As I slowly turned to face north, I saw elk quartering from my left to right approximately 60 yards away! I realized that I was standing in the middle of a slight clearing, but there was adequate cover between them and me, so I very carefully pulled an arrow from my bow quiver. The elk closed towards me as if something behind them was making them nervous. I carefully nocked the arrow and thought the elk might hear my heart pounding. I saw 6 elk, and continued to watch as they quartered toward me. I softly whispered to myself "pick a spot", as I drew back the 145 grain Bear Razorhead tipped carbon shaft. The elk’s kill zone cleared the tree as I concentrated my focus on a tuft of hair in her lung area. I wish I could say I saw the graceful arc of the red-feathered arrow as it sailed towards its mark, but I can’t. The truth is, I don’t remember. I do remember seeing the cow’s reaction though. I saw the red feathers sink behind her right leg, and then saw her jump. She never heard the bowstring being released, the arrow in flight, or my thundering heartbeat. She bolted south while the other elk cautiously ran east. I could hear my breathing and felt my heartbeat pounding in my temples. I heard her cough twice as she was running away with 6" of arrow sticking out of her. Hearing her coughing increased my confidence that my razor sharp broadhead was doing its job in her vital lung area. I lost sight of her and prayed a joyous "THANK YOU, THANK YOU!" I grabbed the two-way radio and excitedly said "I got one! It was a good hit!" "Congratulations" was Dad’s reply. I flagged where I shot from and where the elk was standing when I shot her. I flagged out to the road and met Dad and Ray coming to find me. We stripped out of our heavy clothing in preparation for a hot morning of tracking, and headed back to the area that I shot from. Dad’s laser rangefinder showed that I had shot her from a distance of 23 yards, which was the perfect range for my instinctive, recurve shot. We found our first sign of blood on the ground where she stood while I shot her, and later found blood on both sides of where she was walking. The thrill of the shot did not subside, as I watched two knowledgeable hunters teach me how to follow a blood trail. The blood trail disappeared a few times and we had to get on our hands and knees to pick up a faint speck, then we could continue with our tracking. The trail went about 300 yards. It lead us to the pieces of arrow, and eventually to my first archery kill. She was under a tree, about 400 yards from a water tank. The hole in her right side looked like she had been hit with a howitzer. But it wasn’t a howitzer that hit her. It was an arrow shot from a 55 pound bow that looks like a 2x4 -- that I made. 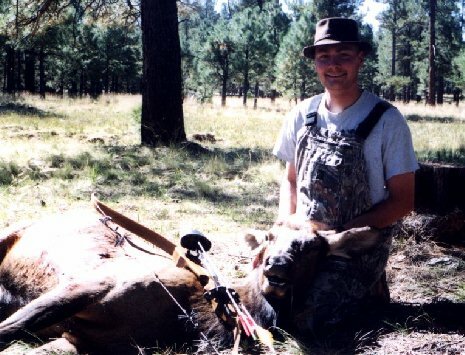 I struggled for a long time looking for a theme to characterize my 2001 archery elk hunt. I finally decided on The Good, The Bad and The Ugly, because this hunt had some of each. This is the same hunt that Chip Heffelfinger writes about in Stump Shooting Put Meat On The Table. I hope that it’s interesting for the reader to see the hunt through two sets of eyes and experiences. As usual, the majority of the hunt is what I would put in the "Good" category. As many of us know, just getting drawn is a major accomplishment. John Heffelfinger and I have been exceptionally lucky in this respect; having missed being drawn only a handful of times in the last 30 years or so of trying. We didn’t get our first choice, bull elk in Unit 5B South, but we did get drawn for cow elk permits in that unit. To me, the essence of any successful hunt comes down to four factors: good friends, good food, good weather and finding animals. In my piece on turkey hunting published earlier this year, I explained how John Heffelfinger and I had been hunting together for nigh on 30 years and how his son Chip had joined us. We had the same crew for the archery elk hunt. Enough said! Over the years John and I have fine tuned our menus so that I would challenge any hunting camp to provide a better fare. A sampling of this years dinners include: carmelized salmon with a citrus salsa, BBQ ribs, bratwurst and peppers, portabella mushroom ravioli, grilled swordfish steaks, wild turkey breast (from our 2001 spring turkey hunt) with all the trimmings, chicken reuben, grilled pork chops, taco soup, ham steaks, and pork loin chops with sauerkraut. 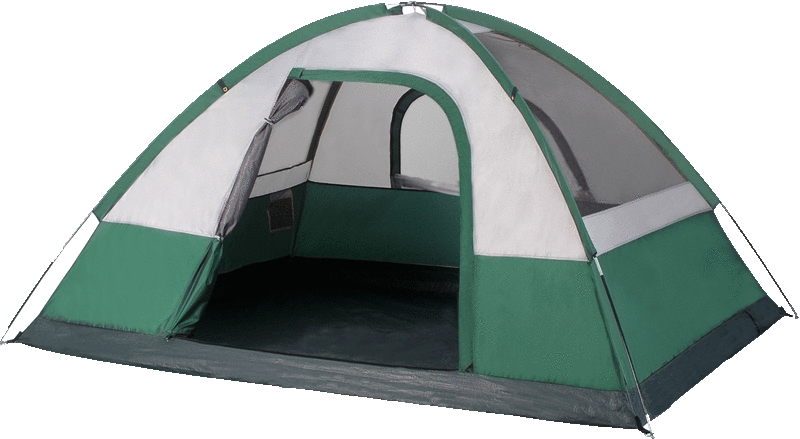 For a camping trip the weather was great. Cool in the mornings and warm to hot in the afternoons. There were a couple of mornings when the temperature was in the high 30’s or low 40’s but mostly it was 7 to ten 10 degrees warmer than that. The afternoons were mostly in the 70’s. For the most part the elk were where we expected them to be. Each one of us had days when we didn’t see anything, but there were only two days out of the two week hunt that at least one of us didn’t see animals. We saw both cows and bulls in enough quantity to validate our choice of spots. In addition, we saw the usual mix of birds, squirrels, and rabbits plus deer, coyotes, fox and turkey. The reader will notice that I didn’t put "killing an animal" on my list of essentials. Certainly getting an animal is a bonus and a fitting end to any hunt. But if I was strictly a meat hunter I would have given up hunting many years ago as being not very cost effective. That said, let me congratulate Chip Heffelfinger on getting his first archery elk. Chip got his elk with a homemade recurve bow on the next to last day he would be hunting. Even though I’m not a meat hunter I love elk meat. Chip gave me some of his elk meat after it was butchered and I have already had several meals off it. This definitely fits in the "Good" category. Another thing which contributed to the success of this year’s hunt is that I’m finally becoming more comfortable with my GPS. I got a new E-Trex this year and I’m amazed at how much faster it acquires satellites than my old GPS40 unit. We used the GPS’s (in conjunction with FRS radios) to get together in the woods, to get back to favorite hunting spots, to re-locate blood trails and to mark promising new areas we want to hunt in the future. It sure is nice to know where camp is or where your truck is parked after roaming the woods all day. The biggest problem with the GPS is remembering what all those cryptic location names mean after you haven’t looked at them for a while. They sure made sense when I entered them! "Good" is also the opportunity to hunt without running into other hunters behind every tree. The hunting pressure in our area was relatively light. We didn’t see more than a couple of vehicles a day go past our camp. And it was a rare sight to see another hunter in the woods. Most, if not all, of the water tanks around us had tree stands set up on them. But since we are not "stand" hunters this had little effect on our activities. As I said above, the weather was great for a camping trip. But, this was an elk hunt, not just another camping trip. This was the second year in a row that the weather was exceptionally hot and dry. As last year, there was only one afternoon where we had a brief rain shower. Other than that, it was completely dry. By the end of the hunt it was like walking on corn flakes. Without any moisture in the air we did not even have the morning dew to help. The heat made it hard to hunt much past 9:00 in the morning, and going out for the afternoon hunt was a joke. I remember elk hunts past where we had continual rain for 4 or 5 days on end. I don’t want that either, but something in between would sure be nice. Health problems don’t help contribute to a fun hunt either. I was plagued by a sore shoulder for most of this year’s hunt. I strained it several weeks before the hunt and suffered with it throughout the hunt. One of the things we usually do in the afternoons around camp is target shoot to keep our aim sharp. Well, this year I didn’t even want to pull the bow back unless I had an animal in my sights for the first week of the hunt. During the second week I started out shooting 3 arrows one day and added 3 more each day until I felt comfortable shooting a dozen practice arrows in the afternoon. John had back problems the whole 2 weeks and sure could have used his chiropractor in camp. Getting old is not for sissies. "Bad" is missing shots that you’ve worked hard to get. Both John and Chip had clean misses. But, Bad is better than Ugly as you will see below. It’s not often that seeing nice bull elk falls into the "Bad" category but I’ll put it here because we had antlerless only tags. By the end of the hunt I could have had at least 6 shots on bulls within my self-imposed 40 yard limit. These bulls ranged from a little two point to a nice 6x6 herd bull. I’ll take this kind of "Bad" any day. Ugly is wounding an animal and not being able to recover it. This is the greatest fear of most bow hunters and the kind of thing that gives the anti-hunters ammunition in their campaign to outlaw hunting as "cruel". In fact, I was so disappointed with my performance this year that I debated even writing this piece. What caused me to change my mind was the hope that telling my tale may keep somebody else from making the same mistakes I made. Accurate shot placement of a razor sharp broadhead with enough velocity to reach vital organs is just as deadly as any rifle/bullet combination. Accuracy comes with practice and shot selection (shooting within your range). Penetration to the vitals is dependent on the equipment used and shot selection (knowing the anatomy of the animal hunted). My equipment included a PSE compound bow with a draw weight of 60 pounds and a 65% let off. My arrows are Easton aluminum 2117 shafts with new Razorback 5 broadheads. I have fiber optic sight pins and shoot a mechanical release. This combination has taken several animals and has proven adequate for elk at the ranges I feel comfortable shooting. No problem here. I had been practicing at Ben Avery archery range weekly throughout the summer and felt that I was ready for the hunt. My sore shoulder might come into play in drawing the bow, but because of the 65% let off I felt that if I could get the string back, I could make the shot. I had already decided that my preferred range was 30 yards or less with a maximum range for any shot of 40 yards. No problem here. Both my shots were under 25 yards. This appears to leave "shot selection" as the reason for my problems this year. Let me explain what happened. On day two of the hunt I was creeping along the side of a hill when I heard a bull elk grunt ahead of me. I just had time to get an arrow out of my bow quiver and nocked on the string when I saw the elk approaching. There were several cows and a nice bull. They were headed in my direction and about 20 to 25 yards above me on the hill. As the lead cow went behind some trees, I had an opportunity to draw the bow without alarming her. I let her keep walking into a little clearing and released the arrow (later measured at a distance of 23 yards). I saw the arrow hit her and a second later heard it hit the ground on the other side. Complete penetration! But wait, it looked too far back to have hit the heart/lung area. The elk ran about 10 yards and started milling around. They were too close for me to get another arrow nocked without having them see me and spook. After a few minutes they wandered off in the same direction they had been heading. After waiting a few more minutes to calm myself down I went to look for my arrow and for blood sign. The arrow was right where I expected it to be and covered with blood from point to nock. I then went back to where the elk was standing when I shot and looked for blood sign. There was none. I got in touch with John and Chip via the FRS radios and they came to help look for the wounded elk. John found the first drops of blood probably twenty yards from where the elk was hit, but I knew right away we were going to have a hard time tracking her. The blood was just drops and they were few and far between. John and I have had a lot of experience blood trailing and I think we do a pretty good job. But this was a lost cause. After an hour or so we completely lost all sign. Using my GPS I went back to the last blood sign later that day and looked some more but never did pick up any more sign. One lost elk. Two days later we were hunting a different area when I heard elk bugling across the valley from my position. I was behind some waist high rocks and could see game trails coming up the hill on both sides of my position. I decided to stay where I was and see what would happen. I stood there for quite a while listening to the elk and had plenty of time to scope out the trails and estimate distances to several points where the elk might likely pass. At last here they come! I could see a good size herd crossing the valley and walking up the hill toward me. There were probably 20 cows and a half dozen bulls, several of which were playing dueling bugles. Unfortunately, most of the herd passed about 70 yards to my right. But at the back of the herd a cow and one of the big bulls made a turn and were coming almost directly at me. They stopped about 40 yards below and just to my right. I had them in my sights and could have taken the shot at this point but decided to wait. Sure enough the cow turned uphill and stopped about 20 yards (later measured at 19 yards) to my right and above me. I let the arrow fly. Oh no! Another bad hit. The arrow was sticking high in her shoulder with very little penetration. In a flash, the elk were gone. Once again I got John and Chip to help look for sign. This time it was even worse. The sign was very sparse and we lost all blood sign very quickly. I spent the rest of that day roaming in the same general area looking for blood or crows feeding on a down animal but had no success. Another lost elk. On elk one, I think the problem was that I shot as the elk was moving. She was not walking fast but she was moving. The spot where I hit her was consistent with the direction she was moving. Elk are long legged animals and can cover a lot of ground with each step. Even at relatively short distances we need to be wary of any shot at a moving animal and adjust our hold accordingly. On elk two I think I made an even dumber mistake. As I said, my first good shot at this elk would have been at 40 yards. I had my sights on her and had the distance locked in my brain. When she moved and I finally got the shot I took I don’t think that my brain processed the range change. My mind was set at 40 yards and stayed there. This is the only explanation I can find. My hit was consistent with a 40 yard hold on a 20 yard target and I don’t normally miss by that far at only 20 yards. Even with a good hit, finding an elk can be difficult. Read Chip’s article for his experience. John also had a good hit on a cow that I helped him track. In this case there were puddles of blood at times and hoofprints filled with blood. We kept expecting to see a dead elk at any time, but we never did. We tracked his elk for about a mile through the woods before we lost the sign. This just reinforced my feelings of angst about screwing up what should have been easy opportunities. On the positive side, I plan on using this year’s blunders as learning experiences to better prepare me for successful hunts in the years to come.